I had a problem I have spent hours trying to fix. My image first went in fine and showed up great in this post as I was creating it and also as I posted it. Then in the morning I came back and there was no image!!! I tried in a whole bunch of ways!! Eventually I decided to see if it would load into my wordpress.com site … no problem at all!! So I brought the link over here and used it. I made it different sizes, added a black border … it was just so weird I can’t tell you!! Occasionally some friends put out a challenge for folks to make their representation of their idea. This week is the Tangled Thursday – Circles all Around “. So here is what Heather saysÂ “Last week I challenged my friends and readers, to use string 71 to create a tile.Â It was the loopiness of it that appealed to me.” So this is a ZIA (Zentangle Inspired Art) using String 71! Zentangle has become popular the last couple of years and I have been intrigued and just starting put my attention to it. 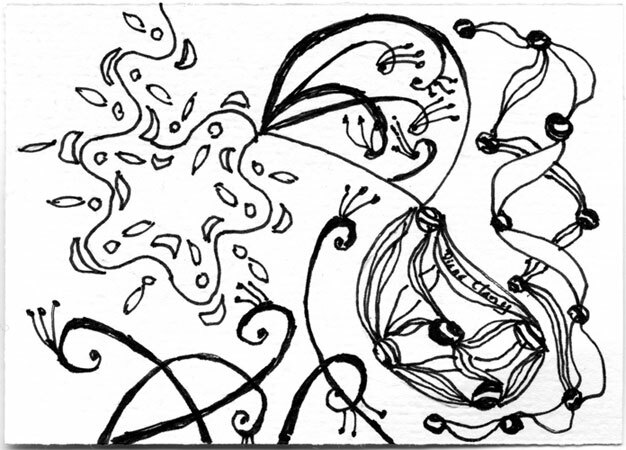 I wanted to try some tangles that are new to me to practice so above is my String 71 Zentangle Tangle ZIA. This – of course – went in a very different direction than expected! I wanted to use 2 specific tangles – Kurlllz and SP-Eye-Ryl to practice them.Â So I used them in this string.Â Really I was stretching how one would usually use a string. …. I ended up using them sort of as the lines of the string and the filling into those loops … but then I ended up using them around the space left by the string also.Â Just how it happened! Giggle Vine is in the upper left corner.Â I used it around the string itself – and then decided that that was plenty for that space – else it would be crowded.Â Then the peacock feather type things in the upper middle are SP-Eye-Ryl.Â They are some around the string itself, come from the string and fill in the string.Â The loop on the middle to bottom right is Kurlllz.Â It usually wouldn’t be used on the edge of the string like I did, but I wanted to use it.Â Then I filled the center of the loop with it too because it looked empty.Â So that is the String 71 itself.Â Then the peacock feathers SP-Eye-Ryl decided to fill the bottom part underneath the string.Â And Kurlllz weaves around to the right of the string.Â So that is all .. just those 3!Â I am always a little shocked when I see my ZIA blown up – all these spaces then show up … but I wanted to get it into this Tangled Thursday challenge. HI Diane, Great job. it amazes me still that we can use the same string again and again and each time it turns out so different. Thanks for joining in with Tangled Thursday. Here’s our challenge for this Thursday. You are most welcome to join in. For this thursday, select a tangle you really enjoy. Show it to us in it’s most common form and tell us why you like it and then show some variations if applicable and finally show a tile that includes this tangle. You don’t need to do full tiles to illustrate the tangle, sketches are great.